By this point, I had stopped buying New Mutants as Magik had graduated to the big league and was a member of Cyclops’ Extinction Team. I had heard this was a great crossover, with it winning the Best Crossover Award over at the Comic Book Resources X-Books forum. This was at the time when the Asgardians were living in Broxton, Oklahoma. I’m not sure why they are there, I vaguely remember it was due to that being where they were reborn after Ragnarok. My only interaction with it was during the Siege crossover as that is where the bulk of the story takes place. 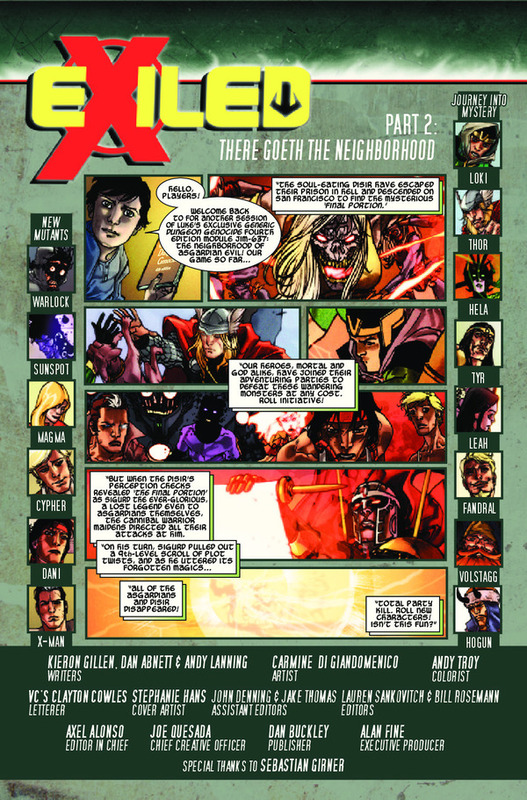 The recap page is done by a young boy who is doing it as if it was a board game, which makes sense in the middle of the comic when we see him again. This is the only part of the crossover that I own (or will own) so any unanswered questions are just going to have to be that. Though it does a decent job of exposing the world. This issue opens with the New Mutants, in San Francisco, and some people have disappeared, as Dani says. 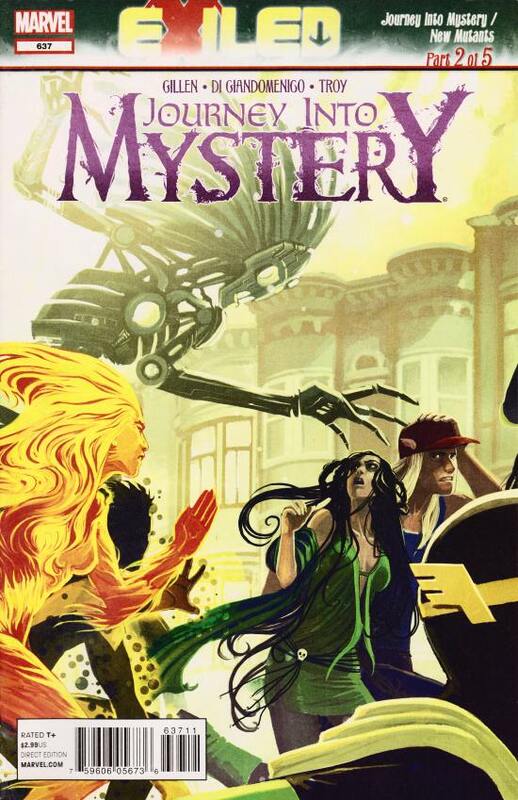 Doug corrects her, a running theme of the issue, that when gods disappear – they are banished. oh Doug, learn to read a room! Dani wants to call the Broxton police as they will know who to contact in the Asgardian community to let them know that Aesir and Disir are either dead or banished. Dani’s next step, and the reason why I bought this, is to go to Utopia and get Magik. Magik can trace the energy signature and be able to send the team after the trail. Sunspot pipes up stating that she is their resident magical guru. Just then, they are home again and eating Doug’s muffins. They are acting as if that’s what they have been doing this entire time. Actually, the muffins are from next door but Doug is going to use his power as food is a language and he can get the receipe via eating it. I’m not sure if that is how his power can actually do, I know it is in a comic and he said it but from what I’ve read Abnett & Lanning, collectively known as DnA (their first names – though I do wonder if Lanning ever doesn’t care for it as it is essentially just Abnett’s initials), they really pushed Doug’s power to some high limits. Dani also questions if that is how his powers works, which may be a meta message as Gillen might be questioning his partner writers in Doug’s powers. X-Man walks into the room and slaps the muffin out of Dani’s hands (he’s a jerk!) and he explains how today is Saturday and the last thing everyone should remember is that it was only Friday night mere seconds ago. Doug pipes up that he can also see that time has been rewritten. Dani starts speaking aloud, about how Sigurd had unrolled a piece of paper. To which Doug corrects her that it is called, a scroll. Oh Doug, if you ever had a chance with Dani – you are losing it! The doorbell rings and there is a blonde mechanic outside, apologizing for the delay in fixing their vehicle. He’s speaking with the Asgardian font – which get use to it as once we leave the team, everyone talks in that font. The mechanic had to repair the church and so that caused the delay in their car repair so he knock a few hundred dollars off. The church is where a woman support group meets, which that group gets mention later in the issue as well. Magma is given the keys to the car, as they are mesmerized by the mechanic. He is force to comment on how they are just staring at the poor guy. He leaves as he is given no response. Once he is gone, Sunspot shouts that was Thor and they all run after the mechanic. The mechanic has made it to his garage, so the New Mutants must have been staring off at him for quite some time. I’m being confused by the setting of the story, are they in San Francisco or are they in Braxton with the Asgardians? Or is there a weird divide and they can be in two locations at the same time? I’m sure those types of answers were established in the first story. 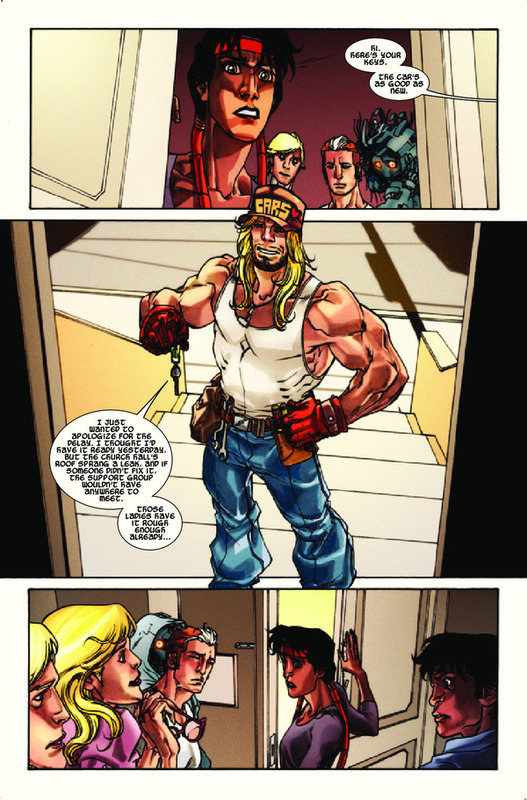 So the New Mutants confront the mechanic, he laughs at being called, Thor. He is a blonde mechanic with a giant hammer, he gets a lot. 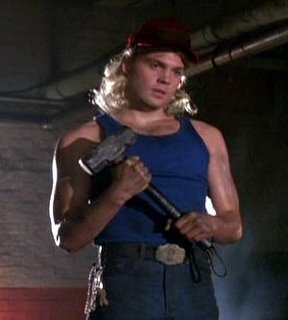 He also makes a reference to the awesome Elizabeth Shue film, Adventures in Babysitting. Thanks to YouTuber geligniteandallies for hosting the video! Yes, that is Vincent D’Onofrio! He’s going to be the Kingpin in the Netflix Daredevil series. I still wonder what made the scriptwriter, David Simkins, write Thor into the script. So funny now, back in 1987, Marvel would have let anyone use their characters (hence the reason why FOX owns X-Men and Fantastic Four and Sony has Spider-Man) but Disney made Adventures in Babysitting (via Touchstone Pictures) and now they own Marvel, so they can have Thor be in all of their films. If only! Speaking of Thor, I like the character, I just have some caveats. I like him on Earth, for the most part. I get he’s an Asgardian but I have no real interest in the day to day of that. I mostly like him in team environments or when he is surrounded by other known characters, like in a crossover event. The only time I ever bought his solo ongoing was after Heroes Return when Dan Jurgens (of Superman fame) and John Romita Jr. was on art. That was such a great series! Plenty of guest stars and they did do Asgard but they made it interesting. Anyway, what I’m getting at is that I really like Adventures in Babysitting and I’m surprised it took this long to make a reference to it in Thor related comic. Unless it happens more than I know but I doubt it. In another house, young children named, Luke and Leia (yep) are in their house alone. Luke is playing a board game of strategy and Leia is tired of him playing with himself (the comic makes the joke!). I get the impression that Luke is the one who is behind all of the mysterious goings on. Leia gets bored of him and goes into their mother’s recycling truck as she just showed up. Helen shouts, bring out your dead (so she must be Hela) and Leia comments on how that makes everyone around them uncomfortable. Luke apparently was dragged along on this quest. He goes into a bakery as he wants some glazed doughnuts. We see that Volstagg is the baker and that he has eaten all the glazed doughnuts as his face, belly and hands are covered in glaze. A blonde lady enters the bakery (this must be the same baker that Doug was talking about) looking for the gluten-free, unseeded, non-dairy, unsugared, unleavened buns. Volstagg, of course, hasn’t eaten those and thus, the buns are available. She is buying them for the support group. There is a cute moment when the blonde lady says that Volstagg looks delicious and he asks her to repeat it and she says the buns look delicious. Luke leaves disappointed and gets chased by a dog. Tiffany offers Luke to join her self-defense class and he turns her down. Another man states that he is happy with that decision as Luke is already a handful. Luke runs into the New Mutants. Apparently, he is a fan of them. He is glad that he ran into them as he was thinking of stalking them. He likes that they are hated and feared and wonders if that means they get better service now. Poor Luke is hated but he’s not feared. Luke goes on to comment about how he is half mutant and sent in an application to the Jean Grey School. Then he doesn’t know if that is insulting or not, and asks them which side (of the Schism) are they on. Dani tries to put a stop to this one sided conversation but Luke keeps going on about how he was Wolverine for Halloween. Dani finally breaks in and says that he is Loki. Which didn’t even dawn on me. Maybe because I’ve been saying it to myself as Luke in the traditional sense but sometimes the caption boxes call him “Luc” like “Look” which would make more sense. Luke / Loki states that she has the wrong guy. 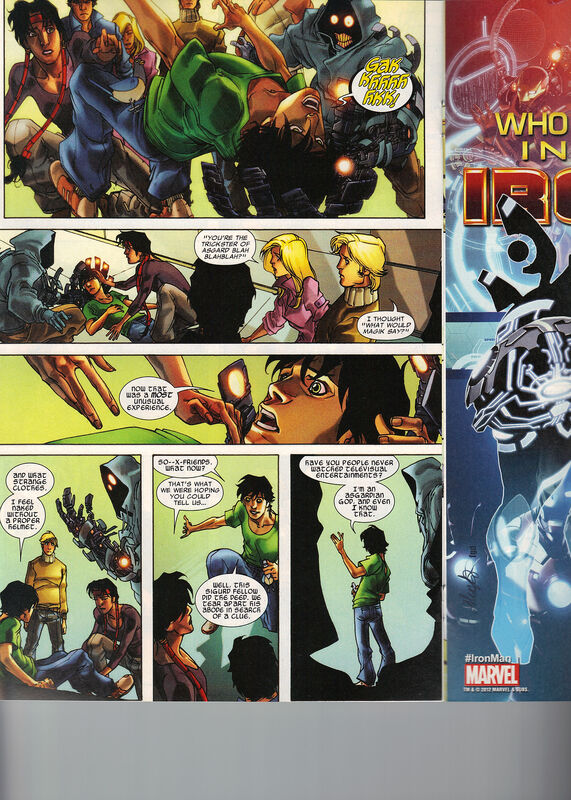 So in the previous issue, is when Loki become Kid Loki – and started on his path of capturing the hearts and minds of comic fans. Dani is a Valkyrie and can see Kid Loki for who he really is. She tries to remind him about Sigurd and what happened the previous night. Doug announces that he is the trickster of Asgard and no spell can hold him back. Poor Kid Loki goes into a spasm. Magma gets bad at Doug, he was only trying to do what Magik would have done in this situation. Kid Loki now remembers who he rightfully is. He wants a helmet to fell complete again. Dani wants answers, Kid Loki tells them that they need to all go to Sigurd’s abode and search for clues – just like they do on television. At Sigurd’s place. Doug has found some armor. Sunspot found a bunch of take-out food. Kid Loki arrives in a Grant Morrison styled X-Uniform. which is way to big for him. Sigurd shows up, he’s hungry. Dani starts asking a slew of questions. She wants to know what happened to the Disir. Whenever Sigurd says the name, it is written D-i-s-i-r, I have no idea the significance of that. Apparently the Disir eat Asgardians, so they are the woman who are starving themselves. So he cast a spell that made all Asgardians forget who they are. 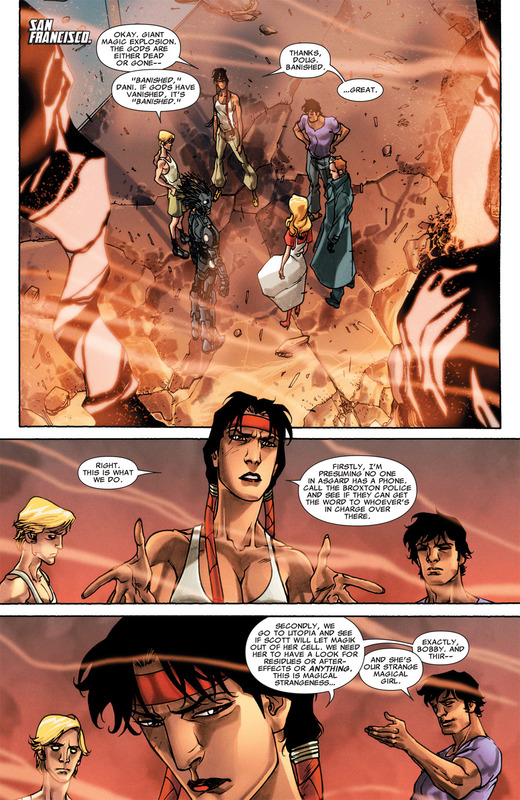 Magma states that there were good Asgardians who now don’t know who they are. Sigurd’s only response is that that is a shame. Dani’s comeback of, you took out one of the greatest heroes in history and all you can say for yourself is that it is a shame. That’s a funny line! Sigurd isn’t a magician, he bought the spell so the dealer should have a counter-spell. Kid Loki needs some time to come up with a counter-spell. Sigurd starts hitting on Dani, she is the hot one of the group, even with Magma standing right there. Oh, the irony! In an alley, a dog is barking at a cat. The blonde from the bakery picks up the cat and devours it. So the Disir are cats, I guess? Now the starving women have something to eat, they should all be happy! That’s how the issue ends, seems like it should be a pretty good story but I’m out of it.